We watched Buffet Froid last night. If you don’t know it it’s a French film directed by Bertrand Blier and starring Gérard Depardieu, Bernard Blier and Jean Carmet. I must have bought it some time ago and then forgotten about it. I do that. A lot of our DVD collection is still in cellophane (just as many of my books are unread). Regular work seems to be improving my attention span though. I’ve finished several books recently and can now cope with whole TV programmes and films on an occasional basis. So we watched it. I didn’t know anything about it beforehand. The cover speaks of a theme of urban alienation, but that hardly does it justice. It’s bonkers. Albert Camus and Luis Buñuel must be major influences. You have to work hard to make some sort of sense of it, but it is an enjoyable task. I’m still working on it today. I can’t see Hollywood remaking it. In other news we have had a bear in the garden. We think it was bear. We have this new bird feeder thing – a pole with hooks on, water bowl, all that sort of stuff. It’s very popular with the birds and Morris the local squirrel. Anyway, this morning the peanut holder has been unhooked, thrown to the ground and the peanuts emptied out and eaten. That’s got to be a bear, right? It might be a squirrel I suppose but Morris is no heavyweight and that nut holder is sturdy. So we have a bear. Or a squirrel. Or an owl – it could have been an owl. They found the smallest dinosaur in the world just up the road the other day but that’s long dead. >This is a link to a picture of Laurence Olivier riding a bike. The cap seems to have the rainbow bands on it and perhaps ‘NISSAN’ on the side. It’s from the film ‘A Little Romance‘ (1979) which I’ve never seen. Anyways – Larry rode a bike in 1979, I rode a bike yesterday. So I’m back on the bike. I rode 2 miles to a café on Sunday as well, just so I could say that I did ride. Yesterday’s effort was deliberately relaxed. A long, flat opening over the Pevensey Levels and then some gentle undulations through Herstmonceux (land of trugs) and Ninfield. The gentler profile of the route meant less energy expended than recent efforts. All in all it was great – good weather and a real ‘build’ to the ride. It may not have had much training value, but it got me back out there. Next weekend’s planned event (the Catford CC 10m TT) is off – my entry was received too late to be considered. I think the Royal Mail may have done me a favour1. The extra time will mean a bit more fitness gained before the ’10’ and ’25’ the following weekend. Easter is out for racing because of family commitments, so it will be May before I get a chance to start racing in earnest. I’m still not exactly champing at the bit. I’m going to try training every other day for a while (rather than 5 days a week) to try and build up the enthusiasm ahead of the fatigue. 1 They didn’t do me a favour when they lost the modem router that I’d ordered though. I ended up having to buy an overpriced one from PC World. Still no refund either. Not that I’m bitter. 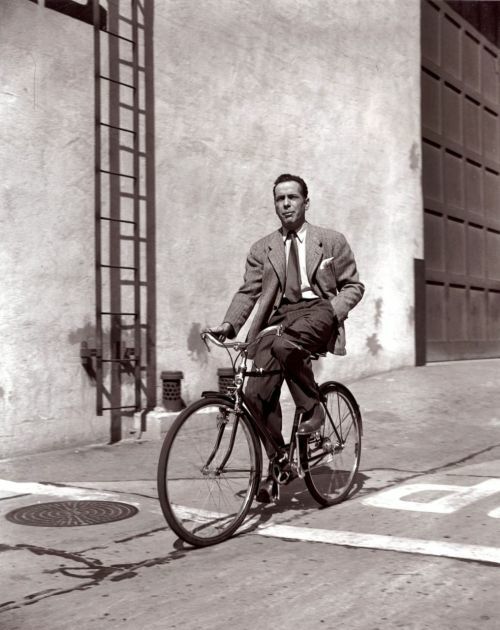 >So who says cycling isn’t cool? Found this on the very more-ish Rides a Bike blog. >Friday night and it was off to the Prom #56 at The Albert Hall. The ascent to picture rail level seemed to help the deafness that has blighted me this week and with 20 minutes to go I got some hearing back – Yay! I still struggled to remain focussed though – I find music difficult. There’s a quote attributed to Sir Thomas Beecham along the lines of “The English don’t understand music. They just like the noise it makes”. I relate to this. The fourth movement of the Bruckner was worth the wait though. Sunday was the Westerley CC 25m TT at Marlow (H25/2). I had high hopes for this, having gone under a couple of weeks ago on the same course. In between times I had put in a heavy (by my standards) training block and had followed this with an easy week. However, the legs and the head weren’t there and I rode poorly – not really trying, which is not the right attitude. I ended up with a 1:03:52, finishing towards the end of the field. In the afternoon we went to see The Illusionist directed by Sylvain Chomet – very enjoyable. This morning I rode the second Westerley CC event of the Bank Holiday: a 10m TT on the H10/22 from Marlow. What a cold day! Most of the climbing on this course is on the way to the turn, so the return should be fast. This morning, however, there was a headwind back and I managed to come home slower! A better, more aggressive ride though. 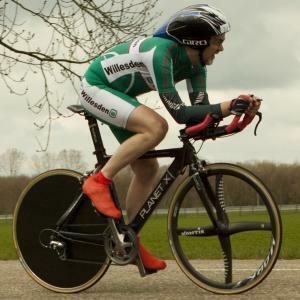 >I rode the Verulam CC 25m TT on the fast F1/25 yesterday. Slightly disappointed with the time – 1:01:45. Slightly disappointed to have to get up at 3:30am as well. It was a still, cool day. What wind there was was against for the last 10 miles. It was our wedding anniversary so we went out for a meal and a film. May I recommend Toy Story 3. This week I finally came off the medication that I hoped was suppressing my TT performances. The stuff is supposed to take a fortnight to clear the system, so I wasn’t expecting immediate results. Saturday was a fun day out. Willesden CC had hired Welwyn Velodrome for the day and 20-25 club members gathered for a couple of hours of swooping up and down the banking in the sun. Unusually for Welwyn there was hardly any wind which, combined with the unseasonal warmth, made for a great day. I was riding poorly, but it didn’t matter. I sprinted enthusiastically and ineffectively, lost wheels, bridged gaps, tried to bully Ray Kelly… all sorts of things. I (and several others) finished the day tired but uplifted. The star of the show was WCC’s multiple champion Jayne Paine. She was supposed to be taking it easy because she was racing at Herne Hill the next day, but show her a finish line and… She won the scratch race at the end by a country mile. Sunday was an early start and a long drive to Tempsford for the Bedfordshire RCC 25m TT on the F1B/25 course. The ‘B’ version of the course is hillier than its F1/25 brother, but a decent ride nonetheless. The start was chilly. Despite it being a ‘slowest 90 riders’ event I was seeded in the second slowest group (on a ‘4’). Accordingly I expected to be caught early doors and to see no other riders ahead of me. I think the seeding was awry: I caught my minute person after about 10 miles and my three minute man after the turn. No one came past me. Most of the climbing is on the way out, but there’s a little climb to the water tower on the way back. What wind there was was against on the return. That headwind really told in the last couple of miles. I blew up a little with seven miles to go, but hung on and hung on to record 1:02:04. That’s an improvement of over 7 minutes on the previous best this year. I’s 83 seconds faster than I have ever gone in April before (and I won the event with my previous fastest). I am chuffed and relieved. And today I am as sore as hell. The stats show a suppressed heart rate, probably because of the sprint efforts on the track the previous day. Race stats: Time: 1:02:04 (24.17mph). First 12.5 miles: 30:56, last 12.5 miles: 31:07. Top speed: 36.0mph. Slowest mile (12): 3:04 (19.57mph), fastest mile (17): 2:03 (29.27mph). Average HR: 153bpm, maximum HR: 163bpm. Average cadence: 78rpm. 23 of 72 finishers. Winner: Tim Davies (Icknield RC) 55:56. What changed? The course was good. The weather was good. I used my best wheels for the first time in the UK this year. All of these are factors, but I hope that the meds were also a factor in slowing me down. If so, things are looking brighter for May. Unfortunately, I only have a club event next weekend. After lunch Pat and I planted a fig tree in the garden. We’ve planted very little because the garden is already well-established. But we had a fig tree at the last house which fruited heavily. If the new tree fruits it’ll make this place feel more like home. In the evening we went to the Renoir cinema to see The Father of My Children. We’d never heard of it, but it’s a wonderful, strange film. With my teaching work I have to read a lot of books on how to write for film. None of them could explain how this film does what it does. Which makes me like it all the more. That was a weekend, that was. >The Willesden CC dinner was good fun with some disgraceful behaviour from our elders, some bad dancing and a fascinating speech from Club President Jim Love about his experience as a competitor at the 1948 ‘ Austerity’ Olympics. I didn’t make it to the Harp Hilly Hundred reliability trial. There were many reasons for this, but the main one was laziness. No doubt the bold fifty who did turn up in the rain will be wupping my @rse for the rest of the season – Karma. There are five more of these Chiltern Classics to come and I’m pencilled in to ride four of them. I expect the weather will be great from now on. Instead of training I headed to the Riverside Studios in Hammersmith for the annual cycling film afternoon. There were some great track films – Herne Hill in the 50s, London 6 days and the American six days – and some footage of Vin Denson winning the Tour of Luxembourg. Vin was there being interviewed by David Harmon. I bought a copy of his new book and he autographed it! There were also interviews with Steve Heffernan and Mo Burton who used to ride for the Archer RC before becoming successful pros. >Sunday was a great day – warm and relatively still. I rode the Hillingdon CC 25m TT on the Marlow course and recorded a time of 1:3:42. This is 3 minutes faster than my previous time this season and my fastest since 1981. It’s a fast course with a 2 mile ‘ski-jump start’ (a fast downhill that you don’t have to climb to finish) and I used the disc wheel for the first time. Together these might explain a 3 minute improvement, but I don’t care. It’s a good time (for me) and it’s on the books. That said, I was only 53rd of the 66 finishers. Monday, by contrast, was a miserable day – rain, rain and more rain. The roads were awash and I used a grippier, heavier front wheel to try and reduce the risk of falling. The weather, tiredness from the day before and the lack of a decent warm up (it was raining!) meant a disappointing time of 26:56 for the VTTA 10m TT, but it’s a minute better than my season’s best (tho’ yesterday’s ride is the equivalent of two and a half 25:19 ‘tens’). It’s my fastest ‘ten’ since 1984. I think the Sunday ride benefited from my reduced training load – my heart rate was faster and my recovery over climbs was good. On Monday my HR was depressed by 8-10 beats. I need to be more conscientious about building recovery into my plans. No more fast rides for a while I think. I only have a 25m TT on the slower Amersham Road course next week. In other news, we saw the Martin McDonagh written and directed film In Bruges last night and this afternoon we went for a walk on Hampstead Heath. The weather, in contrast to the morning, was dry and hot. > Feeling a bit nnfff lately, hence the lack of blogaction. A bit narked by some of the vituperation and weaseliness in the Attempts On Her Life debate (oh Nicholas! ), but some positive contributions on both sides of the argument. Encore is probably a good place to start if you’re interested. I led a session on the play with students in Birmingham yesterday – good fun and seriously engaging. Interval Drinks – welcome to the blog roll. Been watching: and enjoying High Hopes and Before Sunrise on DVD. Booking for: The Miniaturists at The Arcola (including a play by blogonaut Ben Yeoh) and the Herne Hill Good Friday Meeting. Listening to: Dogtanian and The Muskehounds theme tune. Classic. Current ring tone: Roobard and Custard theme tune. Cheers me up. (note: detach the signifier from the signified before use. Important: remember where you’ve put the link for afterwards, particularly with 3 and 4 – confusion can lead to restaurant-based embarrassment and disappointing flowerpottage).